9:00 AM Breakfast in the Boat, then journey starts. 10.30 AM Visting GandiPochamma Temple and darshan. 1.00 PM Vegetarian lunch in the Boat while on travelling. 2.00 PM You will Reach Papikondalu, journey in between " Papikondalu" enjoy the beauty of nature. 3.00 PM You will Reach Perantapalli village in West Godavari district. Visit "Ramakrishna muni vatika" (Ashramam) and Veereswara Swamy Temple and darshan of Load Shiva. 6.30 PM Reach to Pattiseema/Polavaram/Purushothapatnam. 8.30 PM Reach Rajahmundry by Road(30 to 40 K.M). Rajahmundry,Gandipochamma Temple,Polavaram Project, Devipatnam, Pappikondalu,Parentalapalli. Breakfast,Lunch And Tea With Snacks. 7:30 AM Vehicle Journey from Rajahmundry to Pattiseema/Purushothapatnam(30 to 40 K.M). 3.00 PM You will Reaching Perantapalli village in West Godavari district. Visit "Ramakrishna muni vatika" (Ashramam) and Veereswara Swamy Temple and darshan of Load Shiva. 4:30 PM Tea with Snacks and you can plan for playing games in the sand and visit local sight seeing. 9:00 PM Dinner With Veg and Non-Veg and Fire Camp. Solar power will be avaliable till 11:30 P.M.
8.00 AM Local sight seeing by walk in the Forest. 9.00 AM Breakfast will be provided at the camp. 12.30 PM Free time for local sight seeing. 2.00 PM Lunch with Veg and Non-Veg. 3.00 PM BOAT Pick Up (Non/A/C).Return journey by Boat. 6.30 PM Reach Pattiseema / Polavaram / Purushothapatnam. 8:30 PM Reach to Rajahmundry by road. (30 KM). Note : We can drop you at Bhadrachalam on 2nd Day on Demand with extra cost of 100/- per head. Rajahmundry,Gandipochamma Temple,Polavaram Project, Devipatnam, Pappikondalu,Parentalapalli. Night Stay At BambooHuts. Breakfast,Lunch,Tea With snacks,Dinner and Sharing Accommodation in Huts. Individual hut for Family please call @ 9440257037 for the Availability. 7:30 AM Vehicle Journey from Rajahmundry to Pattiseema / Polavaram / Purushothapatnam to get into Boat(30 to 40 K.M). 3:30 PM Get into non A/C Boat and reach Pochavaram village. 4:30 PM Road Journey to Bhadrachalam(60 K.M). 6:30 PM Reach Bhadrachalam and drop you at Temple. Note : Temple will open's till 9:00 P.M. We can provide good Accommodation for our Customer on Demand with less Cost. Rajahmundry,Gandipochamma Temple,Polavaram Project, Devipatnam, Pappikondalu,Parentalapalli,Pochavaram / SriRamaGiri,Bhadrachalam. Child Age limit : 5 to 10 Years . 4:30 PM Get into non A/C Boat and reach Koida / Pochavaram village where road way is connected. 6:30 PM Road Journey to Bhadrachalam(60 K.M).FreshUp at our Lodge. 7:30 PM Visting Temple open's till 9:00 P.M.
7:30 AM Breackfast and Start Journey to Pernasala(35 KM). 10:30 AM Reach back to Bhadrahalam and start Journey to Rajahmundry. 1:00 PM Lunch will be provided at GangareddyGudam. 7:00 PM Visit MadhaAnajanayaSwamyTemple(GangareddyGudam),DwarakaTurumala and reach to Rajahmundry. 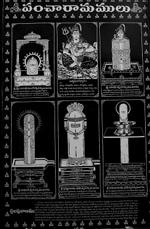 Rajahmundry,Gandipochamma Temple,Polavaram Project, Devipatnam, Pappikondalu,Parentalapalli,Pochavaram,SriRamaGiri,Bhadrachalam. Breakfast,Lunch,Tea With snacks,Dinner And Accommodation At Bhadrachalam. Adult : 4000/-(A/C-Boat,Non-A/c Accommodation ). Child Age limit : 5 to 10 Years. Group Package Minimum 6 Members . 7:30 AM Vehicle Journey from Bhadrachalam to SriRamagiti/Pochavaram(60 KM) by Tata Magic Vehicle. 9:00 AM Reach Boat Point and have a Breckfast. 9:30 AM Start Boat Journey. 1:00 PM You will Reach Perantapalli village in West Godavari district. Visit "Ramakrishna muni vatika" (Ashramam) and Veereswara Swamy Temple and darshan of Load Shiva. 1:30 PM Visit Papikondalu and Lunch near Papikondalu. 6:30 PM Reach Bhadrachalam by Road. 7:30 A.M To 6:30 P.M.
1:30 PM Visit Papikondalu and Lunch at Papikondalu. 4:30 PM snacks and Tea will be provided at Camp and you can plan for playing games in the sand. 8.00 AM Local sight seeing by walking in the Forest area. 12.30 PM Lunch with Veg and Non-Veg. 2.00 PM BOAT Pick Up.Return journey by Boat. 6:30 PM Reach to Bhadrachalam. Note :We can drop you at Rajahmundry on 2nd Day on Demand with extra cost of 100/- per head. Bhadrachalam,SabhariGodavari Sagamam,Parentalapalli,Pappikondalu. Night Stay At BambooHuts. Breakfast,Lunch,Tea With snacks And Dinner Sharing Accommodation(Each Bamboo Hut Four Persons). Individual hut for Family please call @ 9440257037 for the Availability. 2:30 PM You will change into the A/C boat and start journey to Rajahmundry. 8:30 PM Reach Rajahmundry by Road(30 KM). Breakfast,Lunch And Tea With snacks . Breakfast,Lunch Tea With snacks And Dinner,Accommodation At Rajahmundry. Draksharama, Kotipalli, Yanam Rajeev Gandhi beach, Yedurulanka, Masanitippa, Balusutippa, Molletimoga Light House. Inavilli. 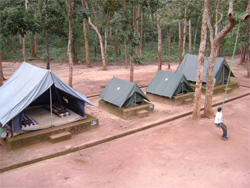 Matrusri Bapanamma Temple, Maredumilli Eco Tourism Project.